I bought these in blue and orange. After soaking in cold water a couple of hours, then washing on delicate, they become soft and absorbent. Really beautiful! 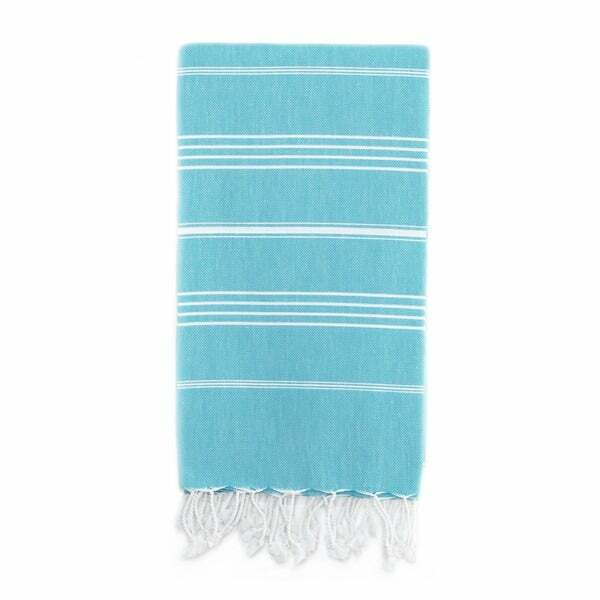 This ultra-soft and extremely absorbent Pestemal Fouta towel is100-percent natural cotton hand-woven on ancient looms in Turkey.The hand woven weave Pestemal Fouta towel is lightweight andgenerously sized, making it perfect to use for home and travel as abath towel, beach blanket or wrap. Famous for its absorbency and ultra-soft, silky texture, theTurkish cotton construction of this Pestemal Fouta towel brings atouch of luxury to your towel collection. Slender stripes create alinear pattern against the bright blue fabric, trimmed with fringefor a traditional design. The towel creates dense folds for easypacking. I am thrilled with my new beach/bath towel. My first impression of this towel was" pretty colour but quite thin. I wondered if it would hold up. After I washed it and used it as a bath towel I was skeptical but was pleased with the way this towel dried despite its thinness. I've used it at the beach/pool, too. I like being able to use it as a light airy way to keep the sun off my shoulders and of course how quickly it dries. This old technology works. This is very different, I loved it, can use it by my poll and at the beach.It gets softer after every wash.Definetly buy more from other colors. I bought several to give as hostess gifts for summer parties. They are perfect.